Misty's Musings: I Won a Puppy! 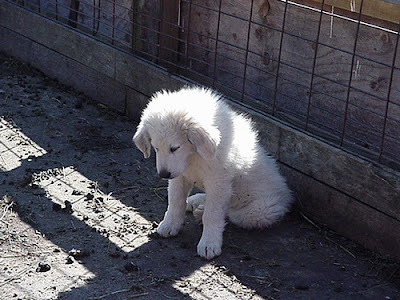 My dad had purchased a Great Pyrenees puppy for my husband and me as our wedding gift. What do you mean a puppy sounds like a strange wedding gift? Remember who is typing this! 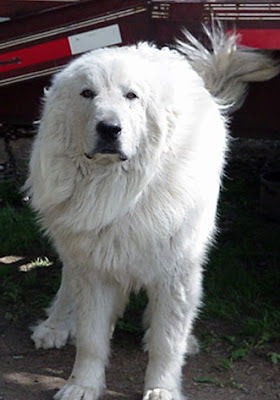 Actually, we had sheep at the time, and my husband wanted a Great Pyrenees to protect the sheep. Well, Bear didn't do much to protect the sheep. He was too much of a kleptomaniac. You see, when it got dark, Bear started 'collecting' his precious treasures. It started with Bear collecting all the cats' feed and water dishes, his dishes, and even the sheep's containers that we would pour feed pellets in. We would wake up in the morning to all of the feed dishes and containers all lined up neatly in front of the barn. After a while, Bear decided he needed more treasures, so he started expanding his searches to the neighbors. We found empty laundry detergent bottles of a brand that we didn't use, empty 2-liter pop jugs when we didn't buy 2-liter pop, flower watering cans, etc. When he came home with a spray nozzle for a garden hose which had obviously been chewed off of the hose it had been attached to, Hubs figured he better contain this kleptomaniac before we got in serious trouble. We lost Bear to a tragic accident, and we miss him deeply. My husband still won't even talk about him or look at his pictures. If his name gets mentioned, my husband tears up and walks away. I think that his missing Bear so much is the reason he actually agreed to my prize if I won the game... well, that and the fact he didn't think that I would possibly win. Here's my beautiful Bear. Wasn't he gorgeous? He was the most loving creature ever. He would sit for hours without moving, as long as I had my arms wrapped around him in a hug. Bear was a beautiful dog. I'm sorry you lost him. Thank you for visiting me with birthday wishes today. I really appreciate it! Bear was gorgeous. I am very sorry he was lost to ya'll. My hubby has a tragic dog story as well that we don't talk about. Is that the new puppy in the top picture? I can't wait to 'meet' the new little one and to hear how Tag, Molly, & Maggie react! hmm, consider this one...maybe hubby lost the pool game on purpose so you could "win" the pup? Not saying you're a bad player, but maybe he really wanted the dog OR maybe he just loves you so much and knew that he would be making you really happy:) Congratulations!! Bear was a beautiful dog. I love white colored animals. I hope your new puppy is just as cute. I think you and I might be "dog karma" twins. I feel about dogs the same way. Each of ours has touched me in ways as deeply as my children. I think a dog would have been an excellent wedding present! Me and hubs would have loved that. Bear was a lovely, beautiful dog. Sorry to go on and on, but I have lost two beloved, long-loved pups (ok they were old in years, but not to me) in the past six months and your post just spoke to me. He looks quite huggable and snuggable. I came by to tell you I am tagging you for a random 7 meme if you'd be interested in playing. Win me a puppy? Please? Pretty please? With a cherry on top? And a bunch of hamburgers? Okay, fine, totally kidding...well, only partially. But I hope you get the puppy after all. Because it sounds like your hubs needs to heal that hole in his heart. And another one will do that. Ease the heartache. I think Wrinkles, my godmom's pug might be nearing her end. The reason I say that is she's drinking like massive amounts of water. And she is 12. I'm glad you get a new puppy! Yay!! And...thanks for dropping by my site with the "cheer me up". I think I was just having a bad day yesterday. Congratulations! What will his name be? Big hugs to you for losing Bear - he was beautiful! A new puppy is absolutely a wonderful prize. I've never seen a Great Pyrenees here. It looks like a nice and gentle breed. Sorry about Bear. I'm sure you have many wonderful memories of him. Thanks for sharing his adorable photo. I am also putting this comment on your other blog. Please add this award to both of your blogs. You writing is beautiful, your prose is inspiring and your picture are awesome. I only ask that you stick with it. BTW, I have three Dachshunds. They, both, keep me sane and drive me crazy at the same time. I wouldn't have it any other way.